Exceptional Air-tight automatic sliding door system from Tormax .. 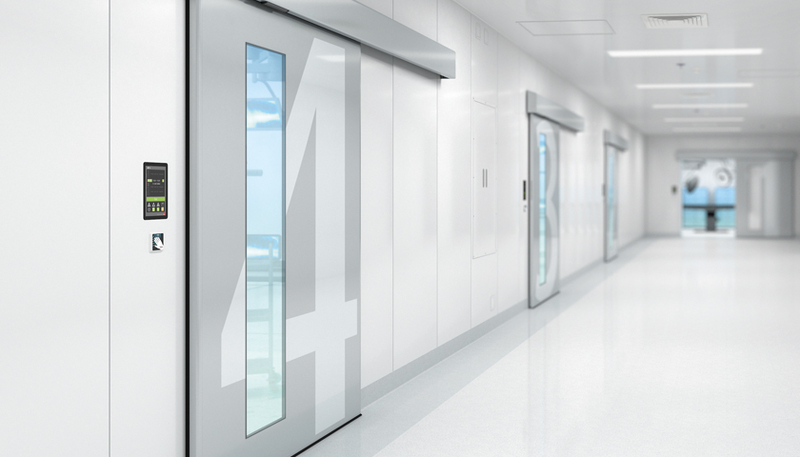 The new TORMAX Hermetic automatic sliding door system delivers a high quality, technologically advanced solution for any location that requires an air-tight entrance, including operating theatres, quarantine zones, laboratories and clean rooms in both research and industry. Delivering unique, all-round sealing, the door leaf automatically slides closed before being fractionally lowered and then pressed firmly against the integral door frame. This ingenious mechanism ensures the TORMAX Hermetic meets the highest safety standards and requirements for air-tightness and is certified to EN16005/DIN 18650. Hygiene is often a crucial issue for locations that require a sealed entrance and the TORMAX Hermetic has been carefully designed to minimise areas where dirt can be harboured. The sensors are seamlessly integrated into the body of the door leaves, ensuring user safety and error-free detection of obstacles whilst encouraging easy and thorough cleaning. There are no guide elements in the doorway, allowing for a seamless floor finish, whilst the upper section of the door cladding itself is gently sloping to remove hard-to-clean corners. The slim and elegant door drive measures just 208x135mm and features sophisticated technology that allows easy operation of the sliding door as well as exceptional reliability, ensuring low ongoing maintenance costs. The Hermetic system is suitable for door opening widths of 800-2000mm, with a maximum height of 2500mm.